A major part of the value that Humanity’s workforce management software offers to managers and employees is time savings. We realize that customer time is extremely valuable and that every moment counts. It is for that reason that we invested a lot of effort in making the upcoming release faster and more time-efficient. This effort included adding new application features like sleek ‘conflict avoidance’ and ‘timeline copy’ as well as behind the scenes improvements, and we’re proud to announce that as a result users should see dramatic decreases in action load times. As part of the new release, Humanity is upgrading its hosting environment to make sure that we can scale to deliver top notch performance when it comes to both speed and uptime. Because of this move, users of our workforce management software will be able to navigate smoothly between different parts of the application and will see a decrease in latency when making several scheduling changes. Humanity’s workforce management software already automatically detects scheduling conflicts before they are made. Our improved interface makes conflict avoidance quicker than ever. 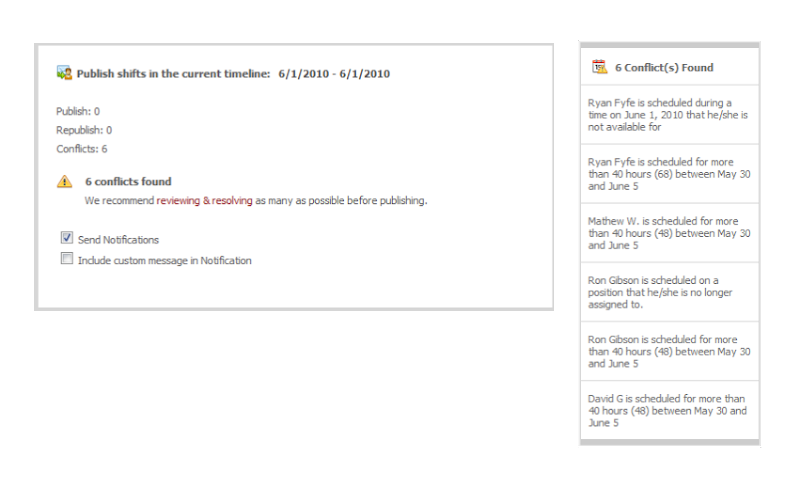 When publishing shifts, managers will be notified of any existing conflicts and will be able to visit the conflicts via a link on the confirmation window. During all other times, by accessing the ‘tool’ icon and selecting “schedule conflicts”, users will be displayed a drop down list of existing conflicts containing information about ‘who’ and ‘what’ has gone wrong. By simply mousing over the conflict, the affected shift will be highlighted in the grid. By clicking on the conflict, you can access the shift edit window and quickly make the necessary changes. The updated conflict feature will offer managers will hectic schedules a definite peace of mind. Perhaps one of the most time-saving features to be made available will be the availability to copy from any timeline. Is the end of the month always a busy week with similar shifts? Will today’s schedule be a lot like yesterdays, but not necessarily always recurring? Then, ‘copy shifts’ is the solution to your scheduling problems. With ‘copy shifts’, either only shifts can be ported over or employee data can be populated as well. We hope that the new Humanity will allow scheduling needs to be taken care of as quickly as ever. Stay tuned for more details about the upcoming release date.